The title of Alison Bechdel’s novel riffs off P.D. Eastman’s book Are You My Mother?, an easy-reader many babyboomers who grew up on the Cat in the Hat reader series might recall. 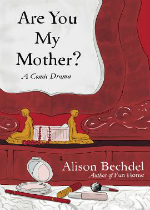 It features a baby bird who tumbles out of his nest, and spends the rest of the book asking a dog, a cow, an old car, and finally a steam shovel, “Are you my mother?” Bechdel asks this same question in this, her follow up book to Fun Home (a book that also unraveled family secrets – especially her father’s). Like the hatchling, Bechdel is trying to find her way back to the nest. But instead of imagining animals and inanimate objects nurturing her, Bechdel wanders through her psyche wondering what kind of mothering her replacement mothers—Donald Winnicott, a British psychoanalyst and pediatrician she admires, or her therapist Jocelyn—provide for her. Fun Home tackled the complex family dynamics of Bechdel’s closeted gay father who ran a funeral home, and who might or might not have committed suicide. 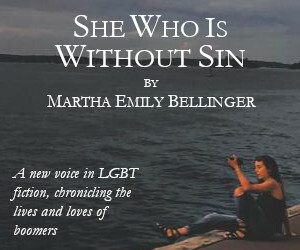 This book tackles the questions left hanging about the other bookend holding the family story upright: Bechdel’s mother, a reader, a music lover, an amateur actor, but also a woman who married a closeted gay man, and stopped touching her daughter when she was seven. Whereas Fun Home was active sleuthing, Bechdel digging through family photos, recalling family events, trying to recreate her now dead father’s life, this book is an inward search. Bechdel examines dreams, visits therapists, reads Freud and Winnicott and Dr. Seuss and obsessively records and studies both her mother and her self. “My mother composed me as I now compose her,” she explains early in the book. The clock of this book is Bechdel’s own time line, scanning from menstrual cycle to menopause. 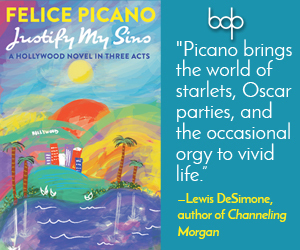 Observations by Winnicott, Freud and others swirl with Bechdel’s own biography and her mother’s. As the book progresses, Jung, Alice Miller, Sylvia Plath, Adrienne Rich and Anne Bradstreet all inform Bechdel’s experience, both directly, and via discovering the influence they had on her parents. The shape of this book is less like a numbered outline, more like a swirling vortex, one that readers of Virginia Woolf will find familiar. And just as readers recognize the whirlpool, Woolf shows up in the story too. The best part of this book is Bechdel’s searches for the voiceless subconscious, which Freud claimed was smothered by the ego. If the ego controls words, how do artists connect with that deeper and sometimes darker, mute self, to siphon the aquifers of truth needed to create art? When the subconscious “speaks,” it often seems like a miraculous answer via dream or eureka vision, but Bechdel shows us the circuitous routes the subconscious takes. Bechdel’s artistic obsessiveness (which she also ponders in this volume) would never allow her to be sloppy. Remember, this is an artist that photographs herself relentlessly in order to so exquisitely render anatomy and character poses correctly. At first the aesthetic of this book seems to strive towards ink wash, more dream inspired, less ordered. But the scratched ink lines takes over; as if the struggles within the plot won’t allow the art to be soft, relaxed, playful, exploratory. Midway through the book, Bechdel notes Alice Miller’s insight that the gifted child with exceptional human observational skills is perfectly poised to become a psychoanalyst (readers know that Bechdel is both this gifted child, and as a cartoonist, also a human analyst). Ironically, Bechdel notes it’s her lesbianism that rescues her from being trapped in her brain, by forcing her to confront the needs of her body, and connecting with at least some of her subconscious needs. The drawback of this book is that the whirlpool which at first felt inspiring (and as Bechdel tells us, dreams of water represent creativity) is by the end of the book an overwhelming eddy of psychoanalytical and literary theory. Bechdel turns to Freud, Jung—and feminist heroines Woolf, Rich and Miller too—to untangle the obsessive, crazy knot of her family. But these torture racks of Western psychoanalysis are as much problem as cure, for an obsessive and brilliant artist like Bechdel, for whom they become yet another trial at which she must succeed. I wanted to rescue Bechdel with a little Zen joke or a bowling date with the Big Lebowski. More to the point, at the end of the book, though I knew more about Bechdel, her mother, and their relationship, I was still left wanting for an answer to the question hanging at the end of Fun House and spanning this book—what was her mother’s take on her husband and her marriage? Perhaps it wasn’t Bechdel’s intent to answer that, perhaps her mother’s take will be always be unfathomable, but ultimately, it felt as if the answer got lost, or buried, in the psychoanalytic search to find it.